This is Richard Wickliffe's fourth novel, inspired by actual crimes. He's a winner of Best Popular Fiction at the Florida Book Awards for his last thriller, which was optioned by a major film studio. Rich enjoys speaking, including at the FBI's InfraGard Counterterrorism conferences. His writing typically borrows from the unique (scandalous, criminal or satirical) environments of South Florida where he resides with his family. Please visit the Rich Wickliffe Author Page on Facebook and RichWickliffe.com to see more. It is a genuine surprise when a successful and happy family man commits suicide on his tenth wedding anniversary, and only he knows his motive for ending his life in the exciting thriller, Eyes of Poseidon, by Richard Wickliffe. Everything changes for Zach Carson, a chiropractic doctor in an obscure Indiana town, when he attends the annual chiropractic conference in Bloomington. Just barely making ends meet, Zach is intrigued when he makes the acquaintance of a wealthy and successful practitioner from Florida. The dynamic man is a principal speaker at the conference and a consultant for a large health consultation network. When Zach learns that by joining the network he can triple his income in three months by moving to Florida, he makes the transition. As predicted, Zach and his wife, Katy, are receiving a more substantial income and enjoying an affluent lifestyle. However, the network is encroaching on his business and Zach is alarmed when a consultant is murdered in his office. Unable to escape the clutches of the formidable firm and concerned for his and his family's welfare, Zach takes matters into his own hands. Will it be enough, or will Zach have made the sacrifice for nothing? 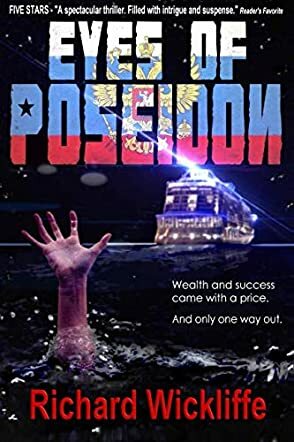 Filled with intrigue and suspense, Eyes of Poseidon by Richard Wickliffe is an exciting thriller with an intense and complex plot. The book opens with a cliffhanger, making it impossible for the reader to put it down until its breathtaking conclusion. With the story moving between the past and the present, fraught with conflicts and unexpected twists and turns, the mystery deepens, and the reader gets caught up in the intensity of the protagonist's world. This is a spectacular thriller with compelling characters and an intriguing story line that will delight those readers who love suspenseful stories told inside out.